Fox, widescreen 2.35:1, languages: English DD 5.1 [CC], English & French Dolby Surround, subtitles: English, Spanish, single side-dual layer, 30 chapters, theatrical trailer, rated PG-13, 121 min., $34.98, street date 3/2/99. Directed by Andy Tennant. Starring Drew Barrymore, Dougray Scott, Anjelica Huston, Megan Dodds, Melanie Lynskey, Patrick Godfrey, Jeroen Krabbé, Jeanne Moreau, Judy Parfitt, Timothy West. A unique 16th century woman, Danielle possesses a love of books, and can easily quote from Sir Thomas More's Utopia. An intriguing mix of tomboyish athleticism and physical beauty, she has more than enough charm to capture the heart of a prince ... after beaning him with an apple. This spirited "Cinderella" is certainly no victim - against all odds, she stands up against a forceful and scheming stepmother, while honoring her late and beloved father. With her keen intelligence and independence, Danielle definitely is not waiting around for the prince to rescue her; in fact, she often comes to his aid, offering him guidance, and even saving the prince's life by carrying him on her back. When Danielle does receive help, it comes not from a "fairy godmother," but from one of history's most renowned figures, Leonardo da Vinci. And, while she does don a gorgeous pair of glass slippers, the words "magic pumpkin" are not in her vocabulary. This is not your grandmother's Cinderella. 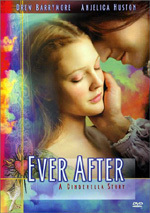 Ever After makes a fine addition to already more than 500 hundred versions of the Cinderella story circulating in the world. What makes this latest adaptation stands apart from the crowd is the modernistic attitude of female empowerment in the retelling of a traditional fairytale. You know that this is not your grandmother's Cinderella when she actually confronts and talks back to her cruel stepmother. Oh, my! Directed by Andy Tennant, the movie is competently made involving a high sense of adventure, romance, deceit, and redemption. Seeing Drew Barrymore in a costume piece is rather awkward at first, like a fish out of water, but as in most of her roles, she will soon win you over with her sweet disposition and effervescent smile. Backing up her performance is an excellent and well developed supporting cast. In such a movie, the leading man could have easily fallen into a cardboard character with a handsome face, but thankfully the script provides newcomer Dougray Scott with a charming and defiant personality that makes him a believable attraction. The most engaging performance turns out to be Anjelica Huston, and while her character is naturally cruel and manipulative, there's a tinge of sympathy and sadness in her protrayal. The script gives logic and reason behind the way why she is and not just an evil caricature. In fact, her embarassing treatment toward the end doesn't befit the moral path that developed in the rest of the movie. While there is some preaching of forgiveness, she is also robbed of her dignity. That's the only wrong message in an otherwise well meaning adaptation. In an unusual decision, Fox decided to release the DVD in the original PG-13 verion, whereas the VHS is edited for a PG rating. I am rather confuse that the original version received a PG-13 rating in the first place, as I don't find anything in the movie that's objectionable for younger kids and would recommend this DVD to any age groups. Thankfully when it comes to the transfer, there's nothing controversial about it as Fox gives the picture an oustanding presentation. The picture retains the original aspect ratio of 2.35:1 and boasts a film-like quality. Digital artifacts are well hidden and images are not overly enhanced for a natural look. Colors are rich and vibrant in the fancy costumes and decorations. Blacks and shadow details are well defined. The dual layer disc has a slight pause during the switch, but not enough to distract. I wonder if the film could be better served in a modern day setting to go along with the attitude. It's not entirely believable to see characters spouting anachronism that's way ahead of the 16th century setting. But if the period setting is just an excuse for filming to take place in majestic castles, pictorial countrysides, and decorative costumes, then I am all for it. I am rather surprised by the richness of the production that's very pleasing to the eyes. The castles in the Périgorde region of Frances are fabulous and photographer Andrew Dunn (Practical Magic, The Madness of King George) certainly knows how to take full advantage by providing graceful wide, overhead, and helicopter shots that sweep across the castle and landscape. The exotic costumes design and superb lighting of the castle during the masked ball is a magnificient highlight of the picture. The encoded 5.1 soundtrack, which can only be selected on the menu, provides a very natural and spacious environment. The split surrounds are subtle and nicely enveloped. Imaging and panning are projected through a wide soundstage and the music is richly integrated. The best part of the soundtrack is indeed the soaring orchestration composed by George Fenton. Without a doubt, 1998 was a tremedously successful and productive year for this classical trained composer having scored for You've Got Mail, The Object of My Affection, Living Out Loud, My Name is Joe, and in my opinion the best score of all last year, Dangerous Beauty. While the romantic theme for Ever After does not quite reach the lush and sweeping scale of Dangerous Beauty, it's still very evocative and passionate. Having treasured the soundtrack album for many months, George Fenton's score got me highly anticipated for the DVD release as I did not see the movie during the theatrical run. Incidentally, the musics by Loreena McKennitt and Robert Miles that worked so well on the trailer did not appear on the film. Nevertheless, it's a deep satisfaction to finally experience Fenton's beautiful score with the film. This year's Academy does a great dishonor by failing to nominate George Fenton in his most prolific year of contribution. Despite the lack of a dramatic finish, Ever After is a pleasant surprise and I happily recommend it to the whole family.